Liquid-liquid measurements can be performed in a glass cell at ambient pressure or in high pressure VLLE set-ups at elevated pressures. 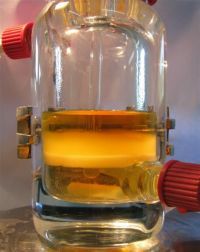 Liquid-liquid measurements at ambient pressure can be performed in a stirred and thermoregulated glass cell. 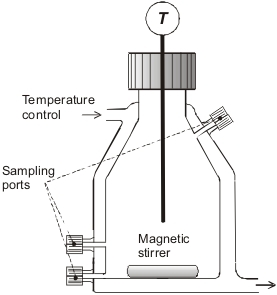 After equilibration and phase settling samples can be taken from both phases and analyzed by gaschromatography, HPLC, titration, photometry or else.